IMAGE: A densely packed galaxy cluster. 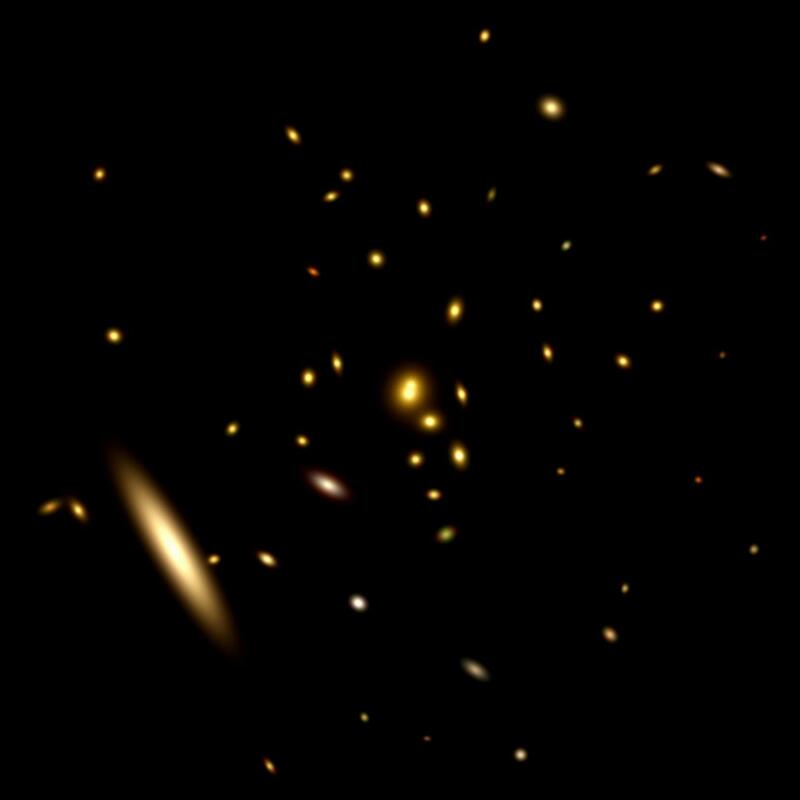 An international team of researchers has found for the first time that the connection between a galaxy cluster and surrounding dark matter is not characterized solely by the mass of clusters, but also by their formation history. Galaxy clusters are the biggest celestial objects in the sky consisting of thousands of galaxies. They form from nonuniformity in the matter distribution established by cosmic inflation in the beginning of the Universe. Their growth is a constant fight between the gathering of dark matter by gravity and the accelerated expansion of the universe due to dark energy. By studying galaxy clusters, researchers can learn more about these biggest and most mysterious building blocks of the Universe. Led by Hironao Miyatake, (formerly JSPS fellow, currently at NASA's Jet Propulsion Laboratory), Surhud More and Masahiro Takada of the Kavli Institute for the Physics and Mathematics (Kavli IPMU), the research team challenged the conventional idea that the connection between galaxy clusters and the surrounding dark matter environment is solely characterized by their mass. Based on the nature of the non-uniform matter distribution established by cosmic inflation, it was theoretically predicted that other factors should affect the connection. However, no one had succeeded in seeing it in the real Universe until now. The team divided almost 9000 galaxy clusters from the Sloan Digital Sky Survey DR8 galaxy catalog into two samples based on the spatial distribution of galaxies inside each cluster. By using gravitational lensing they confirmed the two samples have similar masses, but they found that the distribution of clusters was different. Galaxy clusters in which member galaxies bunched up towards the center were less clumpy than clusters in which member galaxies were more spread out. . The difference in distribution is a result of the different dark matter environment in which they form. Researchers say their findings show that the connection between a galaxy cluster and surrounding dark matter is not characterized solely by the mass of clusters, but also by their formation history. The results from this study would need to be taken into account in future large scale studies of the universe, and research looking into the nature of dark matter or dark energy, neutrinos, and the early universe. The study will be published on January 25 in Physical Review Letters, and has been selected as an Editor's Suggestion. "The signal we measure is puzzlingly large compared to naive theoretical estimates. The sheer number of tests for systematics that we had to perform to convince ourselves that the signal is real, was the most difficult part of this research." "This is truly exciting finding! We can use the upcoming Subaru Hyper Suprime-Cam (HSC) data to further check and advance our understanding of the assembly history of galaxy clusters." "I am thrilled that we have finally found clear evidence of the connection between the internal structure of clusters and surrounding dark matter environment. We checked lots of things to make sure this result, and finally concluded this is real! I am also excited that our findings will give insights on many aspects of the universe, such as large scale structure, dark matter and dark energy, and inflation physics. It is just starting. We hope we can get more exciting results from the upcoming HSC data." "Cosmologist have long held a very simple theory: " the properties of a cluster is determined solely by its mass". These results show that the situation is much more complex: the clusters environment also plays an important role. Astronomers have been trying to detect evidence for this more complex picture for many years: this is the first definitive detection." Did ear sensory cell stereocilia evolve from gut microvilli?